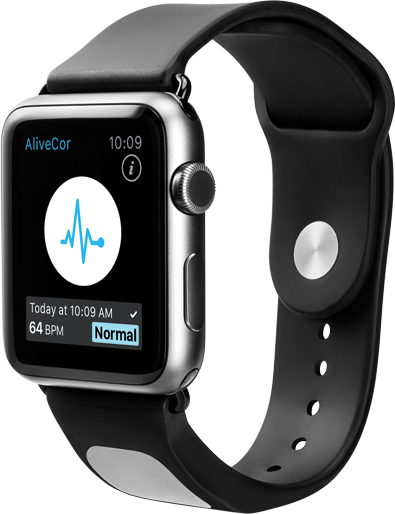 A medtech startup called AliveCor today unveiled what may be the first medical-grade EKG band for the Apple Watch, the Kardia Band, pending its FDA clearance. The product is intended to help wearers detect cardiac arrhythmia conditions that can cause stroke, as well as indicate whether your heart rate and rhythm are normal. The band works with an accompanying Apple Watch application, which automatically processes the data from the sensors in the device, as well as allows its wearers to record voice memos which are sent along with the EKG to their doctor. These voice memos can help doctors better determine what was happening at the time the EKG was recorded, like whether the patient was feeling heart palpitations, if they had just ingested caffeine, or if some other external factor could have contributed to the situation. In addition, the voice memos feature could also be used to track other things that need monitoring, like what you’ve eaten that day or how much time you spent exercising. Meanwhile, the Kardia Apple Watch app also integrates with Apple’s Health platform to allow for analysis of EKG data along with other health factors that may have been recorded elsewhere, including exercise, caloric intake, and more. The new product is the latest to emerge from AliveCor, a medical technology company working to product FDA-cleared EKG technology for mobile devices. Its debut product, now called Kardia Mobile (previously AliveCor Mobile ECG), is a $99 standalone device that adheres to the back of your smartphone or tablet. You can press your fingers on it to take a reading, which would also be analyzed by the accompanying mobile application. The Kardia Band, as the newer product is called, instead puts its sensors directly onto a fairly stylist and sporty looking Apple Watch band. You then press on the band with your thumb to take a reading. The company says that it’s expecting to receive FDA approval for the band later this spring (its 510k clearance), at which point the product will become available for sale. Pricing and further availability information has not yet been released, given its pending status. 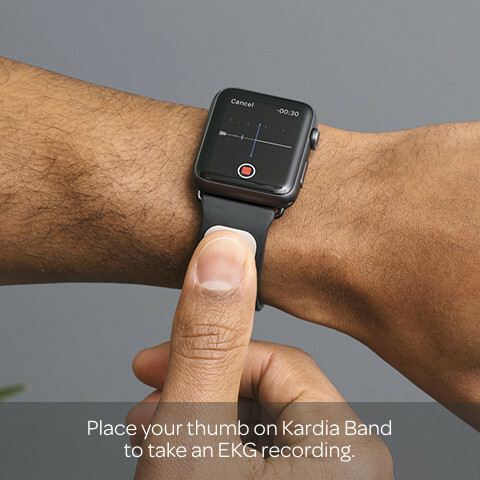 “Kardia Band for Apple Watch represents both the future of proactive heart health and the introduction of the Wearable MedTech category,” said AliveCor CEO Vic Gundotra, the ex-Googler best known for building Google+ from the ground up. Gundotra joined AliveCor in November, following his departure from Google, but was not one of the original founders. “These combined technologies give us the ability to deliver personal reports that provide analysis, insights and actionable advice for the patient and their doctor,” he added. The San Francisco-based startup is backed by over $13 million in outside investment from Khosla Ventures and others. While the new product is largely aimed at those who have a need to detect AF, the most common form of cardiac arrhythmia and a leading cause of stroke, it could also be used by anyone interested in learning more about their health. Of course, whether or not the product will make sense for this wider audience will ultimately depend on the price point AliveCor settles on. *Stayed tuned for TechCrunch’s video demo of Kardia Band in action.